Can a private non-profit organization go public by selling shares of its organization through an Initial Public Offering (IPO), just like businesses do when raising investment dollars? Investment and tax law say no but an innovative nonprofit group serving the homeless has another take. Homeward Bound of Marin in California recently launched an "IPO" in an attempt to raise $1 Million for a new housing complex for families moving out of homelessness. 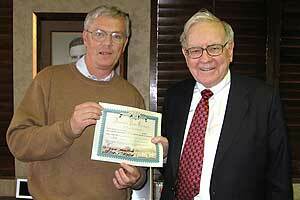 In fact Warren Buffet has lent his name to the effort, purchasing the first $50 share himself. Why isn't the Securities and Exchange Commission and the IRS going after Mr. Buffet and his charitable co-conspirators? Well, because Homeward Bound's IPO is an "Immediate Public Opportunity" and not an Initial Public Offering. The organization's Immediate Public Opportunity is a clever re-branding of an IPO where charitable donations are recast as "shares." By purchasing shares stockholders do not actually own stock or shares in Homeward Bound or any of its assets. The fundraising shares simply offer shareholders an opportunity to "take stock in their community." All money raised goes toward the housing complex capital campaign. Says Homeward Bound's Executive Director, Mary Kay Sweeney, "This IPO offers the chance for people, groups, or businesses to invest at the same level as Mr. Buffett." Homeward Bound has taken it one step further in mimicking the traditional IPO. For purchasing at least one $50 share each shareholder receives a shares certificate and an annual report which details how the money is used and the impact of dollars spent on the community. Homeward Bound shareholders are even invited to attend an Annual Shareholder Meeting with other investors. Through the current campaign the group has already raised over $163,000 toward their $1 Million goal. During a similar non-profit IPO in 2008 Homeward Bound successfully raised over $1 Million for a housing and job training center for the homeless. Hats off to Homeward Bound of Marin and their non-profit IPO. Not only have they pioneered a new fundraising strategy, but more importantly they offer an important reminder to focus on human investments and not just the financial kind. Warren Buffet or not, it's an investment worth making.